The Sabres’ Cody Hodgson battles the Bruins’ Patrice Bergeron for the puck in the first period. The Buffalo Sabres have come out of the Olympic break with some dramatic flair, producing their first two-game winning streak since before Christmas. Wednesday’s 5-4 overtime victory over the Boston Bruins before 19,070 in First Niagara Center was definitely one of their grittiest of the season. Matt Moulson tied the game with 52.3 seconds left and Matt D’Agostini won it on a backhand from the edge of the crease 22 seconds into OT. It came after he sped past Boston defenseman Zdeno Chara to corral a loose puck that had skittered into the Bruins’ zone. The Sabres had a 3-1 lead midway through the second period, gave up the next three goals but rallied to beat the Bruins here for the second time this season. The Sabres won their return to play Tuesday against Carolina as Christian Ehrhoff’s goal with 43.4 seconds left in regulation produced a 3-2 victory. And in their final game prior to the break, they suffered a 3-2 loss in Ottawa on a goal in the final 30 seconds. Moulson had plenty of reason to smile about his tying goal because the Bruins had taken a 4-3 lead with 10:17 to go on Milan Lucic’s power-play tally – which came with Moulson serving a double minor for an inadvertent high stick. The Sabres have won back-to-back games for the first time since beating Winnipeg and Boston on Dec. 17 and 19, and eight goals in two games equals their most in consecutive contests this season. “When you get guys to net and pucks to net, that’s when you start to get bounces,” Moulson said. “I thought we’ve done a better job of doing that lately and that’s what happens. 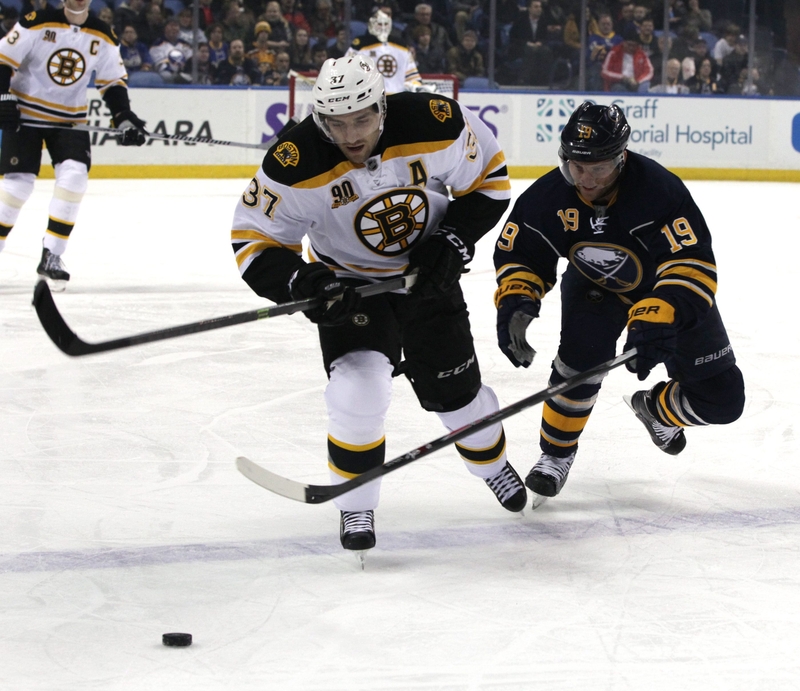 Zemgus Girgensons, Tyler Myers and Brian Flynn staked Buffalo to its two-goal lead before the Bruins rallied to tie on goals by Chara and Brad Marchand. Flynn and Ville Leino had two assists for the Sabres. It was Flynn’s second multi-point game of his career and the Massachusetts native has posted both against the Bruins. He had a short-handed goal and an assist in the Dec. 19 game. The Sabres host San Jose here Friday looking for their first three-game winning streak since last April. It is the last home game prior to the trade deadline, meaning it could be the final appearance here for players like goaltender Ryan Miller, captain Steve Ott and Moulson. Boston coach Claude Julien and center Patrice Bergeron won gold medals for Canada at the Olympics but both lauded the work of Nolan behind the bench for Latvia, which played Canada to a 2-1 game in the quarterfinals that was tied with less than seven minutes to go. Center Tyler Ennis missed Wednesday’s game with what Nolan termed “general body soreness” after taking a hard spill into the boards Tuesday. Center Zenon Konopka confirmed he had surgery on his left pinkie over the Olympic hiatus after breaking the finger in October while playing for Minnesota. Nolan said he should be ready to go Friday. Johnson played goal for the Bruins in place of starter Tuukka Rask, who stayed behind in Boston after leading Finland to the bronze medal ... According to the Elias Sports Bureau, Ehrhoff’s winning goal against the Hurricanes marked the first time in Sabres history a defenseman had scored a go-ahead tally in the final minute of the third period. ... The Sabres are 3-4 in overtime-winning goals this year – and 97-97 in their history in regular-season play.